Shortly after midnight on Sunday, Orenthal James Simpson, 70, walked out of Lovelock Correctional Center in northern Nevada a free man after serving a nine-year bid on charges of kidnapping and armed robbery. 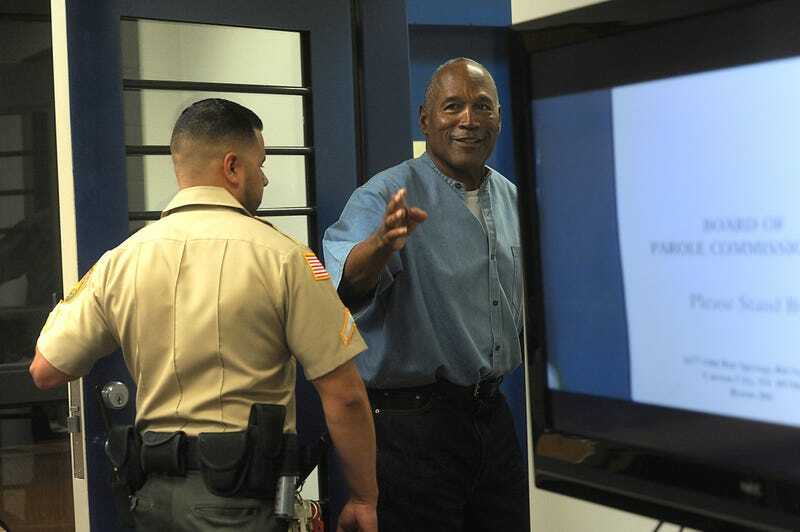 State prisons spokeswoman Brooke Keast told the Associated Press that she didn’t have any information on where Simpson was headed, although the former football star had indicated that he would like to return to Florida, where two of his children, Justin and Sydney, live. Simpson was convicted in 2008 over a Sept. 16, 2007, incident in which he led five men he barely knew to a hotel room in a Las Vegas casino to try to retrieve sports memorabilia items that Simpson said were stolen. Two of the men with Simpson carried handguns, although Simpson insists that he never knew anyone was armed. In 2008, Simpson was charged with multiple felony counts, including criminal conspiracy, kidnapping, assault, robbery and using a deadly weapon. He received a 33-year sentence. In July, a parole board decided to grant Simpson early supervised release. This, of course, was not the first time Simpson had a tryst with the law. Simpson infamously was at the center of the “trial of the century” in 1995, after he was charged with killing his ex-wife Nicole Brown Simpson and her friend Ron Goldman. It brought race, domestic violence, celebrity and professional-sports deification to the fore; it also showed a deeply divided nation along racial lines, especially when it came to the criminal-justice system. Although he was acquitted of killing Brown Simpson and Goldman, Simpson was found liable in civil court and still owes the Goldman estate about $65 million. Simpson has reportedly told friends that he would like to have steak and seafood when he is released, as well as get an iPhone.